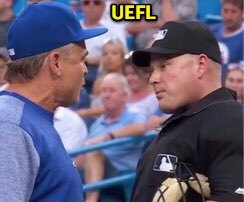 HP Umpire Sean Barber ejected Blue Jays Manager John Gibbons (balls/strikes; QOCY) in the top of the 11th inning of the Twins-Blue Jays game. With none out and none on, Jays pitcher Jake Petricka faced six Twins batters: Eddie Rosario (groundout), Eduardo Escobar (groundout), Brian Dozier (double), Logan Morrison (walk), Jorge Polanco (walk), and Max Kepler (HBP). Replays indicate that of the 17 callable pitches during the inning prior to Gibbons' ejection, Barber officiated all 17 properly (17/17 = 100% accuracy), the call was correct. At the time of the ejection, the Twins were leading, 7-6. The Twins ultimately won the contest, 12-6, in 11 innings. This is Sean Barber (29)'s third ejection of 2018. Sean Barber now has 12 points in the UEFL Standings (8 Prev + 2 AAA + 2 Correct Call = 12). Crew Chief Larry Vanover now has 16 points in Crew Division (15 Previous + 1 Correct Call = 16). This is the 105th ejection report of the 2018 MLB regular season. This is the 43rd Manager ejection of 2018. This is Toronto's 6th ejection of 2018, 2nd in the AL East (NYY 7; TOR 6; BAL 3; BOS 2; TB 1). This is John Gibbons' 5th ejection of 2018, 1st since July 7 (Lance Barrett; QOC = Y [Balls/Strikes]). This is Sean Barber's 3rd ejection of 2018, 1st since June 13 (Matt Kemp; QOC = U [Fighting]).